I have done some research for my future trip (that is not planned yet), but I know I will go back to South America at some point. Here are some places that I will definitely visit - I collected some interesting articles to which I will redirect you. The photos are not mine since I haven't been to these places yet, they link to the original location. these places are in no particular order. Enjoy! I loved Patagonia. In 2012 I visited Torres del Paine and I should've stayed in the area a bit longer and explore less visited sites. Here is an excerpt from a guide book Moon Patagonia. Chiloe is a small island that belongs to Chile, but has a lot to offer. It's wooden churches are declared a world heritage site by UNESCO. If you book a tour you can see wild penguins. It actually is one of few places in the world where Magellan and Humboldt penguins live side by side. Ashray and Zara wrote a short post that is spot on! Chiloe Island is like a movie. If you want to read a longer story about Dani and Jess taking a side trip to Chiloe and read about all their adventures, read the Blind date with Chiloe Island. This is a private national reserve of 600 square kilometers in northern Patagonia. It is dedicated to the preservation of the region’s biodiversity and fauna. 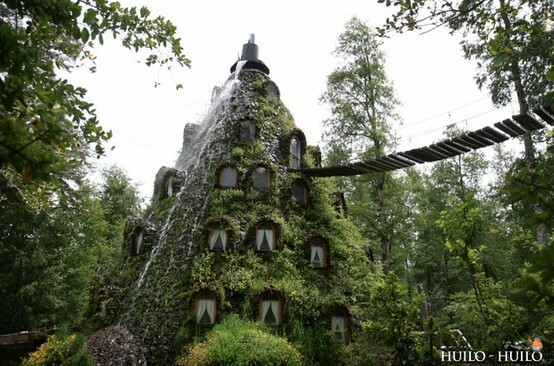 The Magic Mountain Hotel is a cone shaped building with water coming from the top. . It was recommended to me by a Chilean friend, but I couldn't make it there when I was in Chile, so it's on my list for next trip. Hulio Hulio website for some reason doesn't work, I found a short article on Inhabitat.com: Towering Magic Mountain ... Please let me know in the comment section if you come across any interesting articles about it. Cape Horn. The most southern part on the Americas. A challenge for sailors hundreds of years ago and also now. Sherry went on a cruise, I love her story. Tiera del Fuego used to be home for the Yaghan People. Their ancestors arrived here 12,000 years ago by crossing a land bridge before the sea level rose and separated the main land from an Island When the first settlers arrived to the area, these people were quickly wiped out by now ways and diseases. All that there is left is a museum in Ushuaia. If you want to go to the End of the world, you can't skip Ushuaia - another great post from Dani and Jess. ﻿Atacama is the driest place on Earth and also one of the best places to go stargazing in the whole world. Here is some photos to prove this. Best time to go is in winter (June to September). There's also geysers, hiking, a salt lake and other cool things to do. This Park doesn't get mentioned in guide books often, probably because it's not very close to anything. But if you are looking for a place where there is no foreign tourists, only Chileans, this is it. I had to dig deep, but found a nice post and it's funny! If you like ghost towns, this is the first copper mining town in Chile. Nomadic Niko went there and has a lot of information and photos in his post.